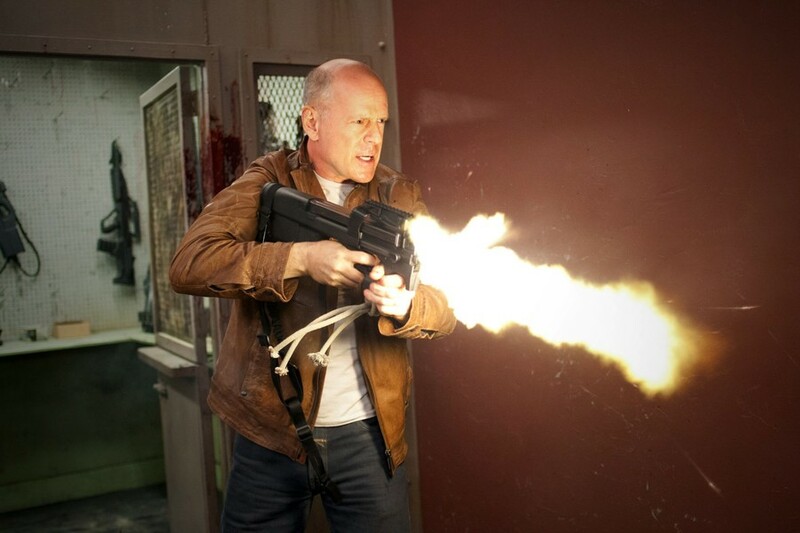 Looper starts with a bang, interrupting the post-trailer abyss with a jarring shot of adrenaline. It ends similarly—another jolt aptly closes the ‘loop’ and brings Rian Johnson’s first foray into the sci-fi thriller genre full circle. Jam-packed with energy, Looper brutally hurls action sequences at an audience kept continually on the edge of their seats. The film clearly aims to leave the viewer breathless and in this venture it certainly succeeds. Joseph Gordon-Levitt stars as Joe, a young, street-smart, and cynical guy who works as a looper—a term given to assassins working for criminal syndicates who specialize in taking down targets sent back from the future. By then, time travel will have been invented and subsequently outlawed, but on the black market time travel is still a foolproof method of assassination. The plot grows confusing, but the movie doesn’t give you time to dwell on details; the camera moves frantically through shots of a dazzling world filled with parties, drugs, girls, and money. Time is a-ticking as Joe shares in the reckless live-for-the-moment lifestyle of his friends, though he scornfully observes through a detached eye the futility of his existence. After all, loopers are loose ends, and eventually they are required to shoot their future selves. They close their loop when they have thirty years left to live. The plot is set in motion when some loops begin to close. A criminal overlord, the Rainmaker, is behind it, and all the young loopers, high on life, start getting reminders of their own expiration date. When Joe meets his future self, played by Bruce Willis, and is unable to kill him, trouble ensues. Joe is driven from the city and led to question the fundamentals of what he took for granted. Apart from Gordon-Levitt and Willis, other major players include Emily Blunt, who acts in the role of Sara, an ex-party-girl-turned-devoted-mother living a self-sufficient life on a farm with her young son Cid (Pierce Gagnon). Despite Blunt’s attempts to humanize Sara and make her more appealing, she remains an aloof, cold, wooden character. Her romance with Joe springs seemingly out of nowhere. Less believable still is Sara’s downright creepy son, Cid, whose temper tantrums literally bring down walls. And while Joseph Gordon-Levitt delivers a great performance, slowly softening towards both Sara and Cid as he evaluates his past life in the city, the attachment he develops towards Cid is difficult to believe in because Cid is an incomparably frightening child, exhibiting almost no traits that would arouse protective feelings. Willis and Gordon-Levitt (who sports prosthetic makeup to more closely resemble his older self) interact well, delivering realistic moments. The motivations driving Willis’ actions, his attempts to guide and protect Gordon-Levitt, and Gordon-Levitt’s struggle against knowing his future, are all elements that give the action, gore, and intense fight scenes in Looper a grittier, deeper emotional draw. What Looper does well that thrillers don’t do in general is develop the relationships between its characters: mother and son, husband and wife, father figures and their protégées, and the peculiar intimacy between young and old Joe. In conjunction with its steadily-building intensity, Looper exposes the vicious sides of human nature—what people will do to survive, to protect those they love, and attempt to escape the stranglehold of fate.